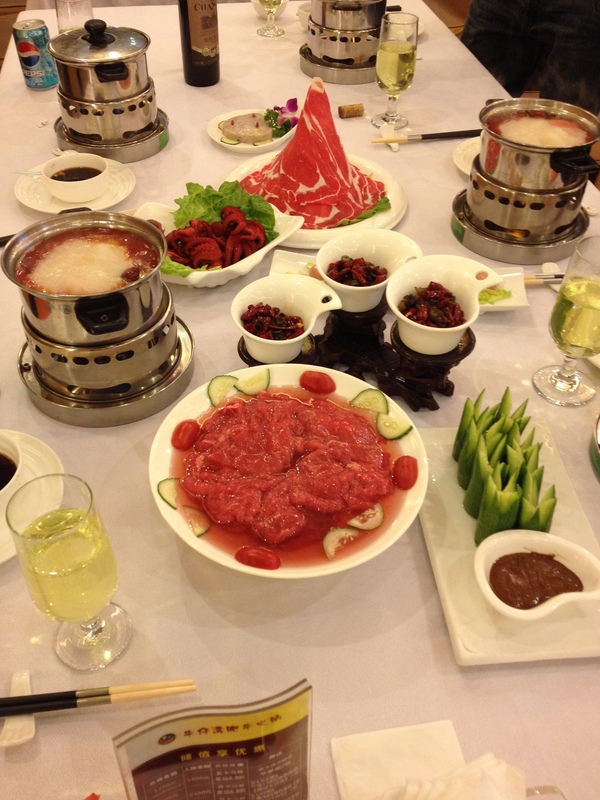 The Sichuan specialty cooking style is called “hot pot.” Have you ever had fondue? Maybe visited the Melting Pot at some point? Hot pot is essentially fondue, except instead of cheese or chocolate, you’re given a broth mixed with chili oil, chiles, and other spices. Chili oil seems to go into most dishes here unless you specifically ask for something not to be spicy (bu la de). Spicy is the default level. I eat spicy in honor of my friends who are not with me and who love spicy food. I could do without it, but I can’t thumb my nose at the jealousy which accompanied me here over spicy food. So yesterday I went for hot pot with Bill, Vega, and the visiting investor Mr. Wu and his wife. Hot pot, at least in the street restaurants, is served communally. In the center of the table is a big, boiling vat of oil and broth, and families just dunk and cook meat and vegetables all together. We went to a “fancy” hot pot restaurant, where each person got their own little cooker. Mrs. Wu was kind enough to stop me before I drank my “soup” which was actually soy sauce and peppers. Mr. Wu ordered food for the table, and asked me to approve the wine. Anyway, so raw food starts arriving. There are artistically carved cucumbers, baby octopus, a sort of cone of shaved beef which is a really artificial red, pureed shrimp paste, chicken meatballs, salmon, veggie trays, some sort of Chinese root vegetable which has a slimy exterior, greens, snails served with chili peppers, and a second “marinated” beef plate (it looks like they marinate it in fruit punch). Me: Mmm! (Grabs baby octopus in chopsticks) I love these! Mr. Wu: Ah, you don’t need to cook it. Mr. Wu: They say, yes, you should cook that. The only thing that keeps me from spitting out my octopus is remembering I’ve eaten it raw before. It’s a sushi dish. Should be fine either way, right? Mr. Wu confirms this once I plop the rest of my cephalopod into the boiling pot. He assumed it would be alright because in Japan he ate it raw too. I take it in stride, and we all have a chuckle at the timing. There are only two parts of the creature which revolt in my mouth – the eyeball (which I spit out, optic nerve attached), and one tiny, curly end of an arm. The latter just felt weird – like I could feel the curliness on my tongue. Nearby is a buffet of additional spices and flavors. I get some peanuts and sesame paste, add a little hoisin sauce and oil, and make a tasty dipping sauce. For my meat, it’s scallions and garlic. I don’t add any more peppers. I break the rules and don’t cook all my veggies. I’m eating some of them raw. I haven’t had a raw carrot in a month, and damn it you only live once! So yeah, let’s eat a piece of cold, crunchy carrot and have one of those artistic cucumbers! Viva la vida! It’s not like I’m drinking tap water. I try the salmon and cucumber dipped in soy sauce. I feel all the eyes of the table on me again – I have missed another important yet to be translated message. All at once I stifle an “Oh my God…” My mouth is coated in burn – icy, horrible burn! The wait staff whisked a liberal amount of wasabi sauce right into the soy sauce. Vega explains this to me as I try to delicately put a hand over my face to stifle my liberated sinuses. I haven’t hit the point where I feel like I’m making a real idiot of myself, but I’m getting close. Other than this and the octopus (and maybe almost drinking the soy sauce – but why put it in a soup bowl and give me a soup spoon if it is not, in fact, a soup? ), the dinner goes nicely. I make sure to cook my meat a little more than necessary, perhaps as compensation for the raw vegetables. The snails are not that good – they’re like the freshwater kind which don’t really have shells, and they’re coated in chili peppers – like hot gummy bears. Now I will be totally snobbish and say I prefer the snails in France. For dessert – fried ice cream (fried ice milk, but you understand). The conversation, from what I can gather, is pleasant. Little of it goes my way, and I am comfortable with that. These are learning opportunities of a different sort. Normally, I carry the conversation and keep people entertained. It’s good to sit back and observe, to be invited to talk every once in a while. I ask Mr. Wu about his visits to the United States. I practice a few Chinese sentences. I drink a lot of hot tea, and miss ice water. And so, the fullest I have been in a long time, I arrive at my hotel. Babiface is having a big party – the theme appears to be Transformers. Or haunted amusement park – April 1 is sort of like our Halloween. But I don’t have heels, so that exploration will have to wait. This Post was posted in Food, Travel and tagged baby octopus, Chinese cuisine, Chinese food, Etiquette, hot pot, Sichuan cooking, Wasabi, Wenjiang. Bookmark the permalink.